Oops! There was some kind of printing error this week, and we accidentally left out the answers to last week's puzzles. Here they are, in pdf form. We apologize for the goof! News on the street this week is that The Vermont Milk Company, a firm launched in late 2006 by gubernatorial candidate Anthony Pollina, has laid off two employees — one permanently and one temporarily. Dennis Myrick, who was hired by the company's board to run the dairy processor and help dig it out of debt, confirmed the rumors to Seven Days early today. The company still has about five employees and does hire temps from time to time, he added. Pollina stepped down from the company at the end of last year as its vice president when he launched his bid for governor. The Progressive-turned-Independent originally claimed to have "run" the company on his campaign website, but when word got out that farmers were owed tens of thousands of dollars for the milk they had supplied, his website was changed to simply say he had been "on the board." If this wasn't an election year, the company's troubles might simply warrant a mention on the business pages — another Vermont company hurt by high fuel prices. But, of course, Pollina is vying for the opportunity to oversee the finances of the entire state of Vermont. Vermont independent gubernatorial candidate Sam Young and Scrabulous have something in common: both have been shut down by the popular social networking site Facebook. Young had his Facebook account turned off for more than a week because, according to correspondence with Facebook that the candidate shared with Seven Days, he was amassing friends at too fast a clip. I caught up with Young this week via, what else, Facebook, where we corresponded. "They have limits set up to prevent people from making too many friends," Young wrote. "Apparently my behavior looks like I am a spammer." "I am trying to use Facebook as a political tool to network Vermont and get the youth involved in politics. This is a really important project to get rid of a Bush Republican who is running our state. If I need to adhere to specific rules that is fine and I am sorry if I have broken them." "Your account was disabled because you exceeded Facebook's limits on multiple occasions when adding friends, despite having been warned to slow down." If Young's account is disabled again, Facebook officials warned, it won't be turned on again. Other candidates running for governor have yet to encounter such problems with Facebook. Incumbent Republican Gov. Jim Douglas, Democrat Gaye Symington and Progressive-turned-independent Anthony Pollina are also using Facebook to keep in touch with some supporters. Only Douglas comes close to matching the friends Young has amassed. The others have garnered only a fraction. A quick note on Pollina's profile page: As of July 29, he was still listing his political affiliation as "Progressive Party." Some habits are hard to break. In June, Hachette, a large U.S. trade publisher, released its last audiobook cassette. Now The New York Times has posted an obituary of sorts bemoaning the death of the cassette tape. "For Hachette, however, demand had slowed so much that it released its last book on cassette in June, with “Sail,” a novel by James Patterson and Howard Roughan. Cassettes have limped along for some time, partly because of their usefulness in recording conversations or making a tape of favorite songs, say, for a girlfriend. But sales of portable tape players, which peaked at 18 million in 1994, sank to 480,000 in 2007, according to the Consumer Electronics Association. The group predicts that sales will taper to 86,000 in 2012." Quite a sad day indeed. Scoring teenage angst will never be the same again. New Teaser Trailer for Oliver Stone's "W"
Here's the first trailer for Oliver Stone's controversial bio-pic about George W. Bush, due out this fall. I haven't been following this movie that closely — I just don't think I can sit through another liberal tale of woe about how Bush has ruined the country. I mean, I go to the movies to escape. But after watching this, I'm curious, mainly because this trailer made me root for him. I think it was supposed to make him look dumb, but I thought it made him look kinda cool. Maybe that's just my "I-have-a-newborn-at-home" sleep deprivation talking. It's eerie how all of the actors resemble the real-life characters they're playing. The dude made up to look like Karl Rove is especially creepy. WDEV: The "Farmers' Market" of MediaLand? 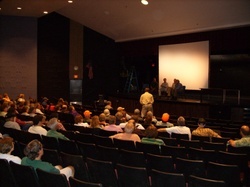 On Wednesday, July 23, a crowd of mostly middle-aged folks from the Mad River Valley crowded into the auditorium of Harwood Union High in South Duxbury. They had braved a thunderstorm to see Tune in Tomorrow, a new documentary by Waitsfielder Ed Dooley about Waterbury-based WDEV, one of the last great small-scale — and politically dichotomous — commercial radio stations in the United States. I thought the film, which includes both archival footage and recent interviews with Amy Goodman (of Democracy Now! ), Vermont Senators Bernie Sanders and Patrick Leahy, media prof/activist/professor Rob Williams and writer/activist/enviro-Godhead Bill McKibben, was really well done. And damn funny, too. Dooley packed in loads of historical stuff — think Model Ts winding down country roads, scratchy old broadcast footage — but in a lively way that showcased the quirky personality of station owner Ken Squier and his WDEV compatriots. Proceeds from Wednesday's event went towards fuel assistance for low-income Vermonters. After the screening, Squier, Williams and McKibben joined filmmaker Dooley on stage for a short Q & A. After McKibben lauded WDEV as the "farmers' market" of our contemporary mediascape, Squier recalled when the writer came to interview him for a 2003 Harper's Magazine story about the station, "Small world: Why one town stays unplugged." Squier said he had initially feared McKibben was "one of those bark-eating people who listens to public radio," but that the Ripton writer ended up producing an accurate piece for the New York City-based lefty zine — even after visiting the WDEV booth at Thunder Road SpeedBowl in Barre. Young people are increasingly drawn to iPODs these days, but "the only thing that counts is being part of a community and being relevant," Squier said of his station's 75-plus-year staying power. No matter what happens to WDEV in the future, he added, small-scale commercial radio must be preserved. "We need local heroes," he said. "You're my local hero!" someone yelled. Tune in Tomorrow airs August 2 at 5:30p.m. on Vermont Public Television. Tune into WDEV at 550 AM or 96.1 FM. 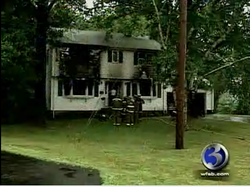 Yesterday morning, at around 6:30 AM, my Grandma's house in Connecticut burned. The fire marshal is calling it a complete loss. While this is tragic, we can be thankful that my Grandma was spending the week in Maine with my mom and dad. When I called home and my sister put Grandma on the phone, I immediately started crying saying, "Grandma! I'm so glad you're OK! And I am SO SAD about the house!" My Grandma responded, "Bridge! I've been wanting to tell you congratulations on covering Elton John!" Sheesh. Apparently I was overreacting? The loss is not just the physical structure of a house, but the memories it held. And the key reminders of those memories; old school projects, handmade crafts, scrapbooks, letters, certificates, and photographs. In sorting my emotions over the past 24 hours, I have come to the realization that my generation is so incredibly lucky that with the help of technology, images and writing of our own memories, will be much harder to lose. After all, if my house burns down when I am a grandma, my grandkids can just download all the albums off my facebook page! Hey, I really wouldn't put it past my generation to embrace senior citizen social networking! And not only are our photos digital, but our videos are, too! And our letters, with many people opting for email. Even journals and diaries are for the most part digital these days, thanks to this very blogosphere. So, consider this your friendly public service reminder to back it up! If not for you, then for your grandchildren! If you are at all curious, you can check out Connecticut's local news coverage of the fire here. This morning, the Vermont Department of Health issued its most recent comprehensive report on public health surveillance of the accident-plagued Vermont Yankee nuke plant in Vernon. The report, which covers the first full year of monitoring following the 20 percent power "uprate," details "higher direct gamma radiation measured at the [fence line] boundary site..."
According to the report, the increased dose of radiation was expected due to the uprate and falls well below federal limits of what's considered safe for human health. Obviously, the NRC knows best what's safe for human health, right? The department's report also includes an analysis of the health of people who live in the six towns near the plant, which found there is no "statistically significant difference" between their overall health and that of anyone else in Windham County. Meanwhile, Health Commissioner Wendy Davis said the state is "keeping a constant and close watch" on radiation measurements at the site. 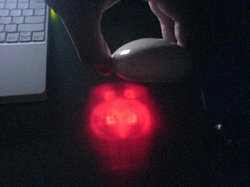 I never noticed this, but it seems that when you hold your Mac mouse an inch or two up in the air, it makes a projection of a mouse. What a hoot. 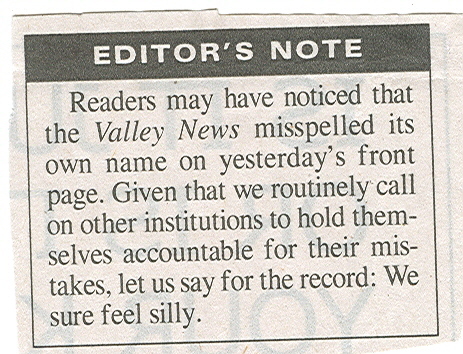 It was every publisher's nightmare over at the Valley News earlier this week, when the July 21 edition featured a banner with the paper's name misspelled. You can see a scan of the edition over at Regret The Error, where we first saw it, via Andrew Sullivan. And then there's the correction, to which we can only add: We bet you do.